CHRIS FROOME HAS been cleared of any wrongdoing in his anti-doping case which had cast a shadow over his participation in the Tour de France. “The Union Cycliste Internationale (UCI) confirms that the anti-doping proceedings involving Mr Christopher Froome have now been closed,” cycling’s ruling body announced this morning. Team Sky’s four-time Tour de France champion has been under a cloud since he was found to have twice the permissible amount of asthma drug Salbutamol in his system during September’s Vuelta a Espana, which he won. Tour de France organisers on Sunday banned Froome from taking part to protect the integrity of the world’s best-known cycling race. Froome and Team Sky have welcomed the UCI’s decision to dismiss the case. “I am very pleased that the UCI has exonerated me,” Froome said in a statement. “While this decision is obviously a big deal for me and the Team, it’s also an important moment for cycling. Team Sky general manager David Brailsford added: “We have always had total confidence in Chris and his integrity. We knew that he had followed the right medical guidance in managing his asthma at the Vuelta and were sure that he would be exonerated in the end, which he has been. This is why we decided that it was right for Chris to continue racing, in line with UCI rules, while the process was ongoing. We are pleased that it has now been resolved. “We said at the outset that there are complex medical and physiological issues which affect the metabolism and excretion of Salbutamol. The same individual can exhibit significant variations in test results taken over multiple days while using exactly the same amount of Salbutamol. “This means that the level of Salbutamol in a single urine sample, alone, is not a reliable indicator of the amount inhaled. A review of all Chris’s 21 test results from the Vuelta revealed that the Stage 18 result was within his expected range of variation and therefore consistent with him having taken a permitted dose of Salbutamol. 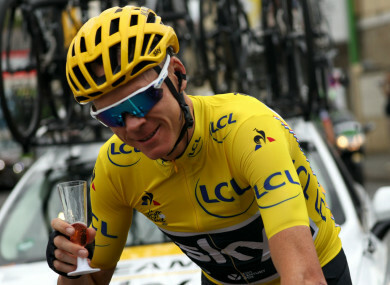 Email “Froome cleared of wrongdoing in anti-doping case and free to race in Tour de France”. Feedback on “Froome cleared of wrongdoing in anti-doping case and free to race in Tour de France”.